Sorry, but there’s no fashion photography here — just an amazing, controversial, challenging, and mind-bending eyeful at Gagosian’s Richard Avedon show, Murals and Portraits. Four large-scale multi-portraits are brilliantly and reverently installed in the 21st Street space, which has been transformed by architect David Adjaye with all-white X-shaped walls that only heighten the drama of the experience. 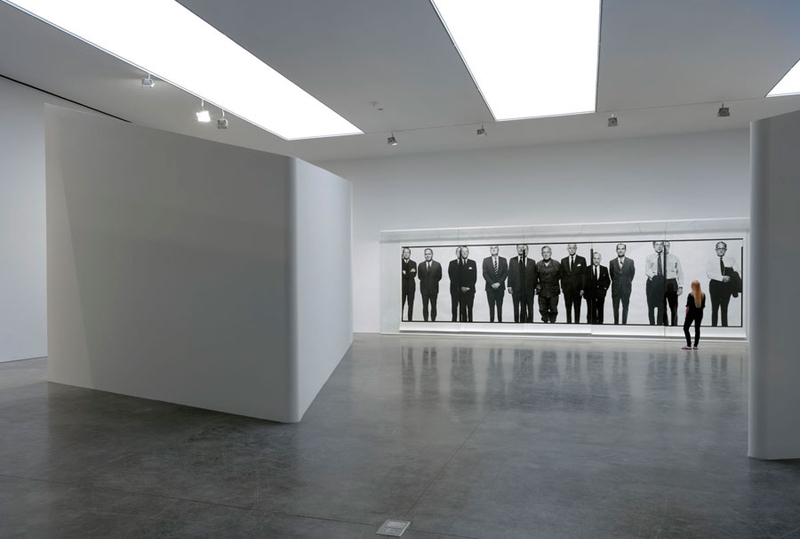 Four pathways draw you toward meeting groups that you might not otherwise encounter –1969 portraits of the Chicago Seven and Andy Warhol’s Factory crew, a 1970 portrait of Alan Ginsberg’s extended family, and a 1975 portrait of the government’s Mission Council running the Vietnam War from Saigon. Download the PDF to match the names to the players. Peeking into the corners of the white spaces, there are dozens of other portraits from the 1960s and 1970s – all related to the four main photomurals and guaranteed to push some buttons. It’s an education in how a fashion master applies his talents to social consciousness, tearing down boundaries, and sly provocation that is not to be missed. This entry was posted in Art and tagged art, culture by mssusanb. Bookmark the permalink.